It's this time of year again when you feel like shopping for new seasons! 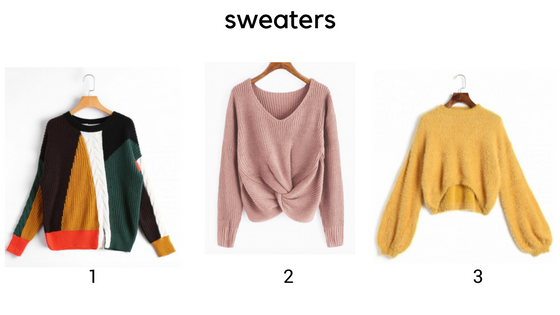 Recently, it got much colder even here in California so I've been looking to update my fall/winter closet with some cute pieces. 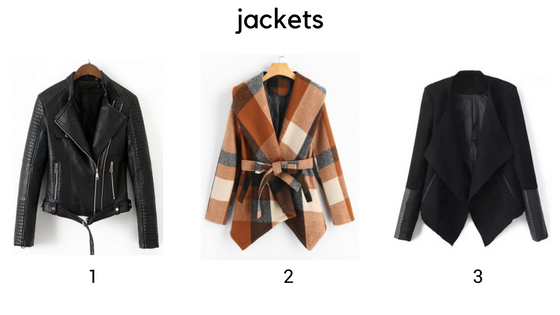 In today's post, I'm sharing what's currently on my wishlist from Zaful. I bet you'll love these items as well! What's on your shopping list right now? Zaful has so many good deal going on! What was your favorite piece? Seems like an answer which is quite simple, and in fact, it is. Of course planning for shopping, whether it is groceries or clothing, will result in savings. No matter what you are buying, when you plan out your purchases and compare you are bound to find the best possible pricing. When you plan, you typically compare. This might include comparing top brands online or comparing catalogues, styles and the latest fashions. In doing this you are going to find the styles you love and want to wear and of course have the opportunity to compare prices along the way as well. Win-win situation for the at home shopper. If you would like to compare some catalogues then Love Catalouges is a great place to start. In many cases, when you plan you also are going to learn when the best times to shop are. For example, buying winter coats in the dead of summer might not make sense to some. But, as a thrifty shopper, you know this is when deals are found. And, you avoid the long lines, hassles, and you are going to avoid crowds fighting for the same item when the colder weather rolls on in. You can plan out items you are going to buy as well. Sometimes this means going with generic items to save on the cost of brand names. In other instances, you might choose bundle packages or other bulk products so you can save on the price of items you are going to buy. As is the case with anything you do (whether it is shopping or preparing for a big match or presentation at work) planning is going to result in better execution. So, if the time has come to buy new clothes for the kids or yourself, if you want to save, find what you need, and find the best designer trends and fashions, plan ahead, map it out, and see how much you can really save in the process. In today's post, I'd like to talk about ordering from an online catalogue. We all know that it often lets you spread the cost of your payments, but you could save money in the process, too. Want to know 3 ways you can get more for your buck when using these retailers? Read along! More retailers are reaching out to customers on social media sites like Facebook and Instagram. These pages are a great way to save money when online shopping. You'll be able to find the latest discounts on products and services, as well as industry news and information from your favorite retailers. If you want to save even more cash, why not sign up for a retailer's mailing list, too? You can have the latest discounts delivered to your email inbox on a regular basis. If you receive too many messages, you can unsubscribe at any time. Some online catalogues let you collect points when you make purchases, which you can redeem on future orders and save cash. Although these loyalty schemes differ depending on the company, they have become increasingly popular in recent years. You can check the number of points you have accumulated by logging into your personal account on the retailer's website or by contacting their customer service team. If you're not sure which retailer to shop with, use a comparison website like shop2day which will list the cheapest retailers that sell the products you're looking for. These sites not only save you cash but will prevent you from having to spend ages searching the Internet for the best deals and promotions. Once you've found a few retailers that you're interested in, you can head to their website and check out their products. If you want to spread the cost of your order, you can also apply for a credit account, which will enable you to budget more effectively. If you're accepted for an account, you can repay your order in installments. Once you know these 3 simple steps, you're all set!